The greatest Italian boat exhibition continues reorganizing itself and is also aiming at becoming once again the European pleasure boat Show of reference in three years. As far as the October 2014 edition is concerned, the organizers' strengths will be concentrated on the direct involvement of international operators and media, on promoting Made in Italy products and on a new exhibition layout that also gives great importance to the world of sailing. It's coming back as popular as it used to be, starting right from last year's positive experience. 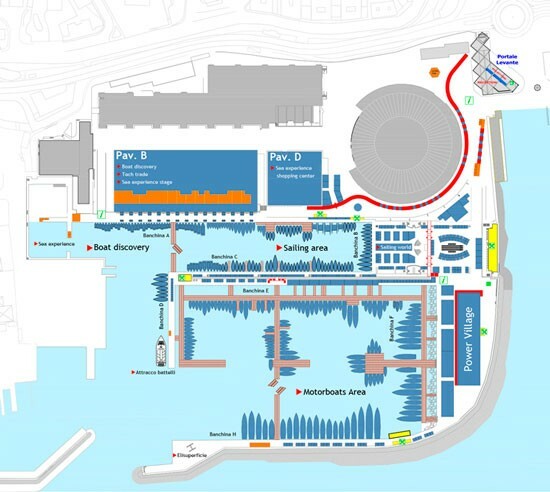 This is the goal of the 54th Genoa International Boat Show, scheduled from October 1st to October 6th 2014. The relaunch goal to be achieved within three years has one of its points of reference in the strong international vocation. With this in mind, starting from the 2014 edition, those major international buyers that will find the Genoa Boat Show a perfect location will be accommodated in the center of the Mediterranean so that they can arrange their own network of relationships and admire the best Italian boats. They will be given great attention since a special area will be set‐up at Padiglione B (Pavilion B) for holding customized meetings. Then the major European and American media dealing with the sector, as well as those of the developing countries and the Middle East will also be involved through targeted invitations. Among the changes, it will last a day longer than last year in order to meet the operators' demands. The exhibition format will resume some of the strong points which were appreciated the previous year. As a matter of fact the heart of the show will "beat" down at the sea so that sea trials can easily be performed and several other boats can be put into the water bringing the advantage of a more pleasant view and lower costs. 24 Great attention will be focused on the world of sailing which will be given a new spot, the Sailing World. A larger area compared to the past which will include the entire inner dockyard that allows exposing up to 120 boats in the water and more than 6.000 square meters of space on the ground, along the docks and under the tensile structures where also charter, competitive sailing, nautical tourism and port facility operators will be allowed to exhibit besides just shipyard and sailing accessory operators, as well as sailing schools and federations. Great attention will be given to the excellence of Italian food: as a matter of fact something completely new at this edition will be the Food and Beverage Court, where leading players in this sector will offer the best Made in Italy wine and food. In general, the organizers' will focus in improving the services provided to operators and visitors, so to make their stay at the show easier and more pleasant. What was really appreciated by visitors last year was the decision about dividing the various kinds of products noticeably: sailboats, motorboats, accessories, engines. Also this year we will continue the same way. In addition to the Sailing World, even the Power Village which houses engines will be back, while the large dockyard will be used for mooring motorboats and Pavilion B will be reserved for accessories, inflatable boats and outboards. The heart of the new exhibition will also rely on a strong investment in the promotion of Made in Italy products. Italy is objectively among the best places in the world as far as nautical tourism is concerned: the Genoa Boat Show may be considered its capital and the first vehicle to promote it and to make it become popular throughout the world. The Italian excellence certainly has an ideal strong point in the boating industry which has always developed itself thanks to good quality and distant tradition. Also other sectors such as fashion, design, food and wine, jewelry, art and the architecture have all the credentials to become stronger as a driving force for economy based on the quality of Made in Italy products.